Divided Inside are a thrash metal band hailing from Albuquerque, NM. True to the old school masters, their music cuts to the bone with raw aggression. Their surly songs waste no time. They hit the ground running with beefy guitar riffs, solid bass lines, double kick drumming, and gruff vocals. This style is a nostalgic throwback to 80’s heavy metal, when death metal, thrash metal, and punk were breaking new ground and gaining mainstream traction. Beyond The Gates of Death, released on April 13, 2018, is a worthy follow up to the 2009 demo, Words of the Fallen. Throughout their musical career, Divided Inside have the authentic style of New Mexican metal music. They are professional and talented, and yet rugged and rough around the edges. This aesthetic lends itself well to traditional thrash and heavy metal. The instrumentation is well balanced and symbiotic. Each element – melody, rhythm, lyrics, etc. – is strong and robust without overpowering the others. Themes of anger, death, and destruction are prominent throughout this release. This exemplifies the rowdy attitude of early thrashers like the “Big Four”: Anthrax, Megadeth, Metallica, and Slayer. Combined with subtle literary and cultural references, their music is surprisingly deep and complex. For example, The Condemned is a strong track, and the lyrics seem to allude to the gothic novel Frankenstein, a masterpiece of classical horror. Ultimately, this band is very dynamic. 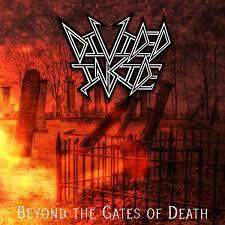 Beyond The Gates Of Death is a solid album, showcasing the capabilities of Divided Inside. Check it out on Bandcamp, Spotify, or CD Baby. 3 stars out of 5!